What Are The Big 5 Personality Trait Types? It is important to be aware that the personality tests used in the recruitment and selection process are the intellectual property of the companies that produce them. As a result, they may use different terminology to describe the aspects of personality that they set out to measure. This usually for reasons of copyright and to differentiate themselves in a market in which there are a large number of products that do more or less the same thing in more or less the same way. To avoid any bias and to steer clear of any copyright issues, we will use the definitions placed in the public domain by the noted psychologist Dr. John A. Johnson of Pennsylvania State University. The personality traits used in the 5 factor model are Extraversion, Agreeableness, Conscientiousness, Neuroticism and Openness to experience. To take a free personality questionnaire based on the 5 factor model, click here. It is important to ignore the positive or negative associations that these words have in everyday language. For example, Agreeableness is obviously advantageous for achieving and maintaining popularity. Agreeable people are better liked than disagreeable people. On the other hand, agreeableness is not useful in situations that require tough or totally objective decisions. Disagreeable people can make excellent scientists, critics, or soldiers. Remember, none of the five traits is in themselves positive or negative, they are simply characteristics that individuals exhibit to a greater or lesser extent. Each of these 5 personality traits describes, relative to other people, the frequency or intensity of a person's feelings, thoughts, or behaviors. Everyone possesses all 5 of these traits to a greater or lesser degree. For example, two individuals could be described as ‘agreeable’ (agreeable people value getting along with others). But there could be significant variation in the degree to which they are both agreeable. 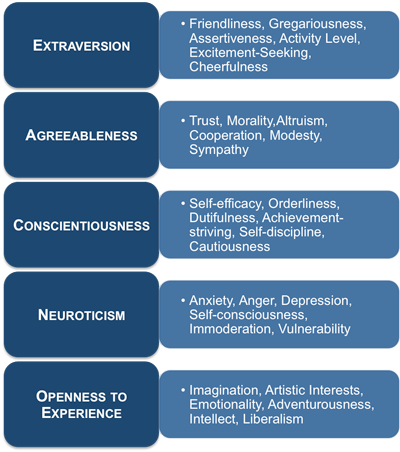 In other words, all 5 personality traits exist on a continuum (see diagram) rather than as attributes that a person does or does not have. Freud originally used the term neurosis to describe a condition marked by mental distress, emotional suffering, and an inability to cope effectively with the normal demands of life. He suggested that everyone shows some signs of neurosis, but that we differ in our degree of suffering and our specific symptoms of distress. Today neuroticism refers to the tendency to experience negative feelings. Those who score high on Neuroticism may experience primarily one specific negative feeling such as anxiety, anger, or depression, but are likely to experience several of these emotions. People high in neuroticism are emotionally reactive. They respond emotionally to events that would not affect most people, and their reactions tend to be more intense than normal. They are more likely to interpret ordinary situations as threatening, and minor frustrations as hopelessly difficult. Their negative emotional reactions tend to persist for unusually long periods of time, which means they are often in a bad mood. These problems in emotional regulation can diminish a neurotic's ability to think clearly, make decisions, and cope effectively with stress. Each of the big 5 personality traits is made up of 6 facets or sub traits. These can be assessed independently of the trait that they belong to. Friendliness. Friendly people genuinely like other people and openly demonstrate positive feelings toward others. They make friends quickly and it is easy for them to form close, intimate relationships. Low scorers on Friendliness are not necessarily cold and hostile, but they do not reach out to others and are perceived as distant and reserved. Gregariousness. Gregarious people find the company of others pleasantly stimulating and rewarding. They enjoy the excitement of crowds. Low scorers tend to feel overwhelmed by, and therefore actively avoid, large crowds. They do not necessarily dislike being with people sometimes, but their need for privacy and time to themselves is much greater than for individuals who score high on this scale. Assertiveness. High scorers Assertiveness like to speak out, take charge, and direct the activities of others. They tend to be leaders in groups. Low scorers tend not to talk much and let others control the activities of groups. Activity Level. Active individuals lead fast-paced, busy lives. They move about quickly, energetically, and vigorously, and they are involved in many activities. People who score low on this scale follow a slower and more leisurely, relaxed pace. Excitement-Seeking. High scorers on this scale are easily bored without high levels of stimulation. They love bright lights and hustle and bustle. They are likely to take risks and seek thrills. Low scorers are overwhelmed by noise and commotion and are adverse to thrill-seeking. Cheerfulness. 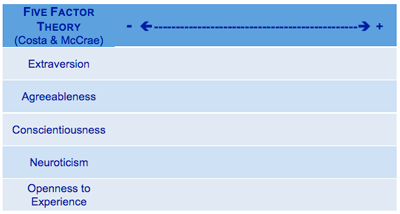 This scale measures positive mood and feelings, not negative emotions (which are a part of the Neuroticism domain). Persons who score high on this scale typically experience a range of positive feelings, including happiness, enthusiasm, optimism, and joy. Low scorers are not as prone to such energetic, high spirits. Trust. A person with high trust assumes that most people are fair, honest, and have good intentions. Persons low in trust may see others as selfish, devious, and potentially dangerous. Morality. High scorers on this scale see no need for pretence or manipulation when dealing with others and are therefore candid, frank, and sincere. Low scorers believe that a certain amount of deception in social relationships is necessary. People find it relatively easy to relate to the straightforward high-scorers on this scale. They generally find it more difficult to relate to the low-scorers on this scale. It should be made clear that low scorers are not unprincipled or immoral; they are simply more guarded and less willing to openly reveal the whole truth. Altruism. Altruistic people find helping other people genuinely rewarding. Consequently, they are generally willing to assist those who are in need. Altruistic people find that doing things for others is a form of self-fulfilment rather than self-sacrifice. Low scorers on this scale do not particularly like helping those in need. Requests for help feel like an imposition rather than an opportunity for self-fulfilment. Cooperation. Individuals who score high on this scale dislike confrontations. They are perfectly willing to compromise or to deny their own needs in order to get along with others. Those who score low on this scale are more likely to intimidate others to get their way. Modesty. High scorers on this scale do not like to claim that they are better than other people. In some cases this attitude may derive from low self-confidence or self-esteem. Nonetheless, some people with high self-esteem find immodesty unseemly. Those who are willing to describe themselves as superior tend to be seen as disagreeably arrogant by other people. Sympathy. People who score high on this scale are tender-hearted and compassionate. They feel the pain of others vicariously and are easily moved to pity. Low scorers are not affected strongly by human suffering. They pride themselves on making objective judgments based on reason. They are more concerned with truth and impartial justice than with mercy. Self-Efficacy. Self-Efficacy describes confidence in one's ability to accomplish things. High scorers believe they have the intelligence (common sense), drive, and self-control necessary for achieving success. Low scorers do not feel effective, and may have a sense that they are not in control of their lives. Orderliness. Persons with high scores on orderliness are well-organized. They like to live according to routines and schedules. They keep lists and make plans. Low scorers tend to be disorganized and scattered. Dutifulness. This scale reflects the strength of a person's sense of duty and obligation. Those who score high on this scale have a strong sense of moral obligation. Low scorers find contracts, rules, and regulations overly confining. They are likely to be seen as unreliable or even irresponsible. Achievement-Striving. Individuals who score high on this scale strive hard to achieve excellence. Their drive to be recognized as successful keeps them on track toward their lofty goals. They often have a strong sense of direction in life, but extremely high scores may be too single-minded and obsessed with their work. Low scorers are content to get by with a minimal amount of work, and might be seen by others as lazy. Self-Discipline. Self-discipline-what many people call will-power-refers to the ability to persist at difficult or unpleasant tasks until they are completed. People who possess high self-discipline are able to overcome reluctance to begin tasks and stay on track despite distractions. Those with low self-discipline procrastinate and show poor follow-through, often failing to complete tasks-even tasks they want very much to complete. Cautiousness. Cautiousness describes the disposition to think through possibilities before acting. High scorers on the Cautiousness scale take their time when making decisions. Low scorers often say or do first thing that comes to mind without deliberating alternatives and the probable consequences of those alternatives. Anxiety. The "fight-or-flight" system of the brain of anxious individuals is too easily and too often engaged. Therefore, people who are high in anxiety often feel like something dangerous is about to happen. They may be afraid of specific situations or be just generally fearful. They feel tense, jittery, and nervous. Persons low in Anxiety are generally calm and fearless. Anger. Persons who score high in Anger feel enraged when things do not go their way. They are sensitive about being treated fairly and feel resentful and bitter when they feel they are being cheated. This scale measures the tendency to feel angry; whether or not the person expresses annoyance and hostility depends on the individual's level on Agreeableness. Low scorers do not get angry often or easily. Depression. This scale measures the tendency to feel sad, dejected, and discouraged. High scorers lack energy and have difficult initiating activities. Low scorers tend to be free from these depressive feelings. Self-Consciousness. Self-conscious individuals are sensitive about what others think of them. Their concern about rejection and ridicule cause them to feel shy and uncomfortable abound others. They are easily embarrassed and often feel ashamed. Their fears that others will criticize or make fun of them are exaggerated and unrealistic, but their awkwardness and discomfort may make these fears a self-fulfilling prophecy. Low scorers, in contrast, do not suffer from the mistaken impression that everyone is watching and judging them. They do not feel nervous in social situations. Immoderation. Immoderate individuals feel strong cravings and urges that they have difficulty resisting. They tend to be oriented toward short-term pleasures and rewards rather than long- term consequences. Low scorers do not experience strong, irresistible cravings and consequently do not find themselves tempted to overindulge. Vulnerability. High scorers on Vulnerability experience panic, confusion, and helplessness when under pressure or stress. Low scorers feel more poised, confident, and clear-thinking when stressed. Imagination. To imaginative individuals, the real world is often too plain and ordinary. High scorers on this scale use fantasy as a way of creating a richer, more interesting world. Low scorers are on this scale are more oriented to facts than fantasy. Artistic Interests. High scorers on this scale love beauty, both in art and in nature. They become easily involved and absorbed in artistic and natural events. They are not necessarily artistically trained or talented, although many will be. The defining features of this scale are interest in, and appreciation of natural and artificial beauty. Low scorers lack aesthetic sensitivity and interest in the arts. Emotionality. Persons high on Emotionality have good access to and awareness of their own feelings. Low scorers are less aware of their feelings and tend not to express their emotions openly. Adventurousness. High scorers on adventurousness are eager to try new activities, travel to foreign lands, and experience different things. They find familiarity and routine boring, and will take a new route home just because it is different. Low scorers tend to feel uncomfortable with change and prefer familiar routines. Intellect. Intellect and artistic interests are the two most important, central aspects of openness to experience. High scorers on Intellect love to play with ideas. They are open-minded to new and unusual ideas, and like to debate intellectual issues. They enjoy riddles, puzzles, and brain teasers. Low scorers on Intellect prefer dealing with people or things rather than ideas. They regard intellectual exercises as a waste of time. Intellect should not be equated with intelligence. Intellect is an intellectual style, not an intellectual ability, although high scorers on Intellect score slightly higher than low-Intellect individuals on standardized intelligence tests. Liberalism. Psychological liberalism refers to a readiness to challenge authority, convention, and traditional values. In its most extreme form, psychological liberalism can even represent outright hostility toward rules, sympathy for law-breakers, and love of ambiguity, chaos, and disorder. Psychological conservatives prefer the security and stability brought by conformity to tradition. Psychological liberalism and conservatism are not identical to political affiliation, but certainly incline individuals toward certain political parties. It is possible, although unusual, to score high in one or more facets of a personality trait and low in other facets of the same trait. For example, you could score highly in Imagination, Artistic Interests, Emotionality and Adventurousness, but score low in Intellect and Liberalism.